Well, I’m back home from my Bay Area trip. I got a lot to catch up on, but not as much as I hoped. We got over to the course with ample time to warm up and check out the facilities. The clubhouse here is very nice and so are the practice facilities. 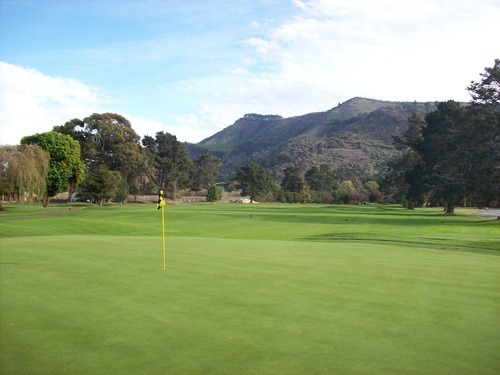 They have a nice grass range, good chipping area, big enough practice green and even a small warm-up green right next to the first tee box. We were able to peek our heads into the members’ locker room, which was very nice. Of course, we looked at some of the name plaques to see if there were any famous names, especially that of Carmel’s most famous resident/golf enthusiast, Clint Eastwood. 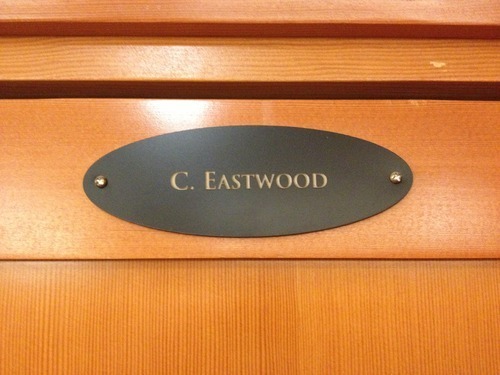 His honorary member locker is right in front, so it didn’t take long to find it and it definitely helped make our day. We teed off right on time and played at a nice steady pace as a twosome behind a few member groups. 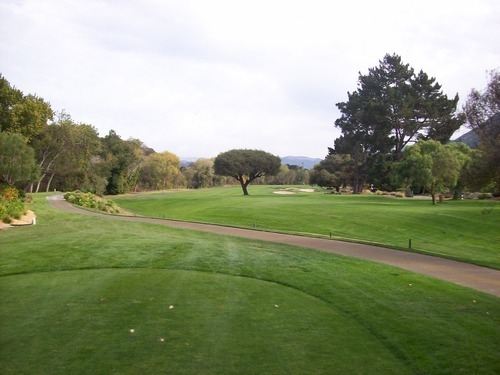 Overall, the round took about 4 hours, which was ideal because we had to drive all the way up into San Francisco afterward. I didn’t know much about this course coming in. 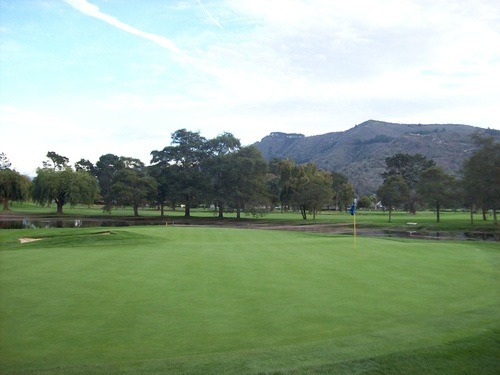 It had just recently been added to the Greenskeeper.org database, and that was the first I had heard of it. I was pleasantly surprised with what we encountered there. 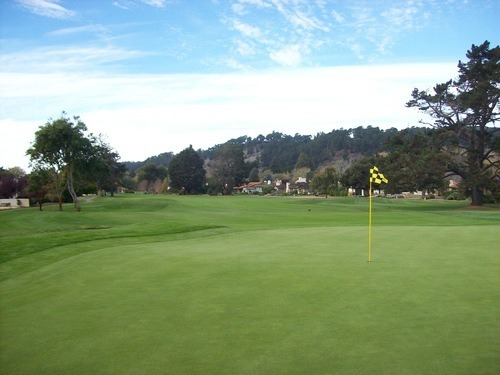 It’s a beautiful course that’s well-maintained and deserves its place among the pantheon of beautiful Monterey Peninsula courses. 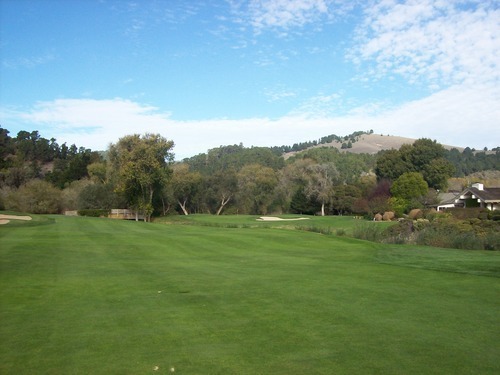 Quail Lodge is not the most challenging course you will play, but it does have enough challenge to keep you working. 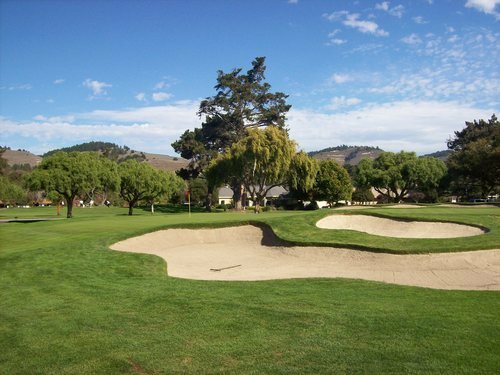 There are trees, ponds, well-placed fairway bunkers and plenty of OB stakes as it winds through a residential area. 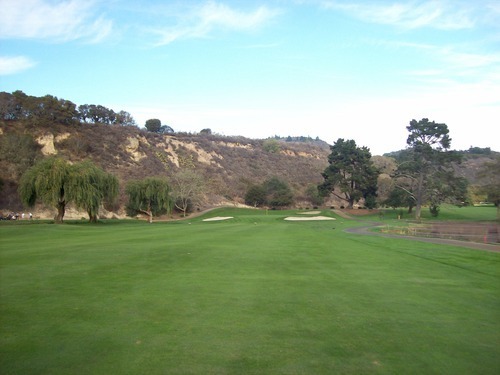 Overall, the terrain is very flat with one small elevated section that encompasses the 4th green and 5th tee (a great downhill par-3). 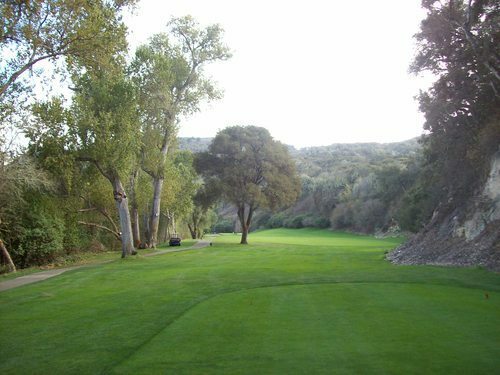 A canyon wall borders the edge of a number of holes and creates a nice secluded setting, especially on holes 10 through 12. 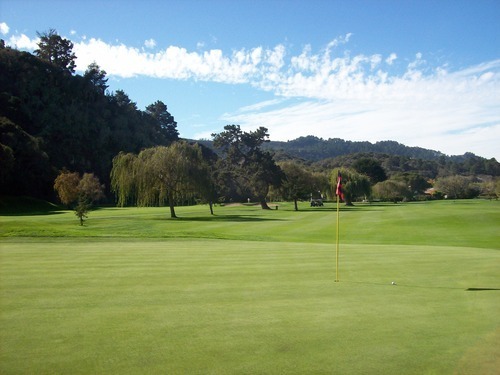 Otherwise, homes and the lodge surround many of the holes. 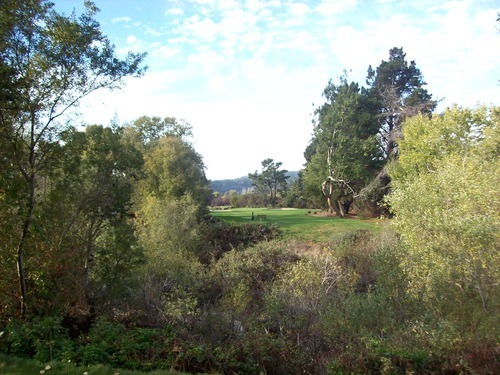 The Carmel River runs through the back nine and the property is covered with a large variety of trees to create a very pretty setting. 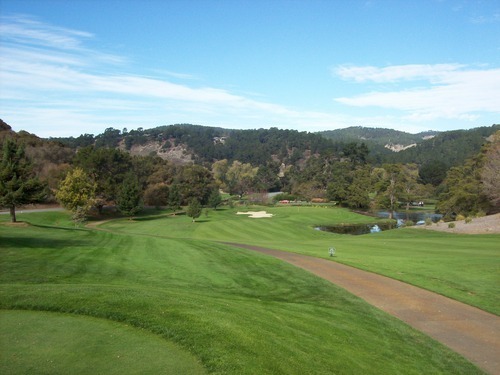 The course was designed by Robert Muir Graves, was opened in 1964 and is apparently his first 18-hole design. My only minor complaint with the layout is that on some of the holes, the houses and residential streets come very easily in play. 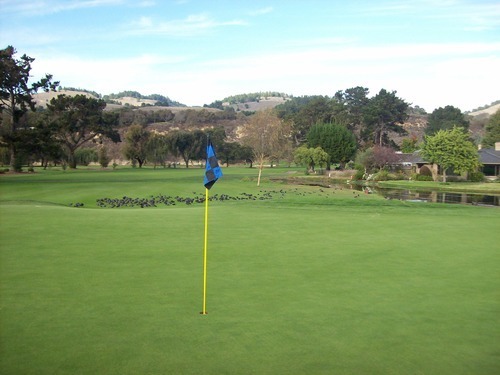 You don’t have to hit your ball far off course to get into trouble or potentially cause property damage. For obvious aesthetic reasons, they don’t have fences and stuff up for protection, so it is what it is. 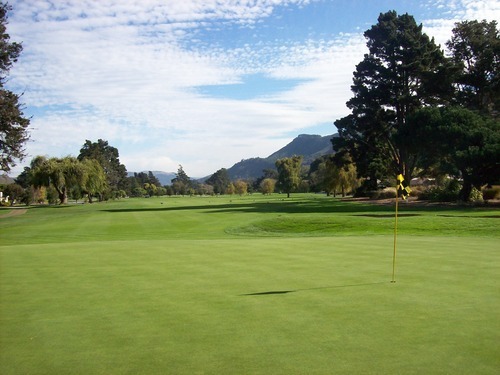 Condition-wise, the course was in excellent shape. 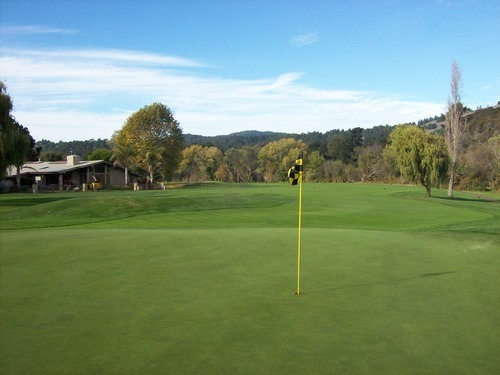 The greens were some of the nicest I’ve ever played. 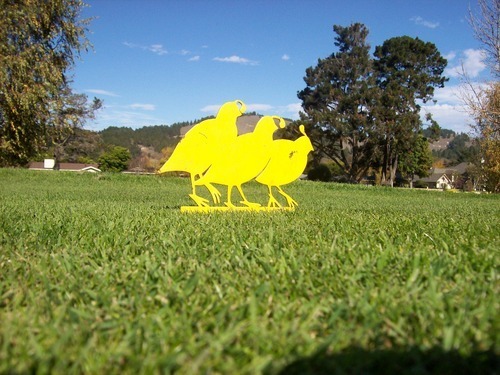 They are receptive on approaches and perfectly smooth on putts. 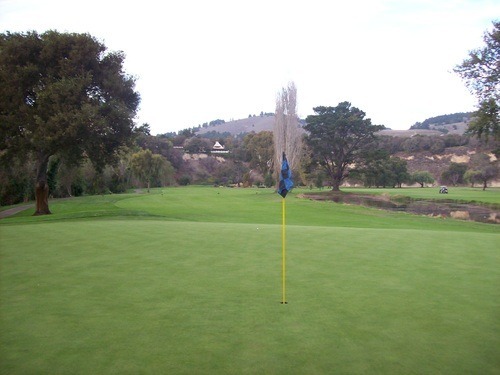 They ran at quick speeds and had absolutely perfect putting surfaces. 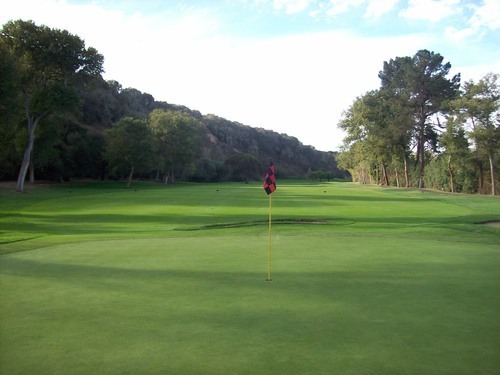 The greens here don’t feature much undulation (with the exception of a few like on hole 17) and what you see is what you get in terms of breaks. Extremely nice. 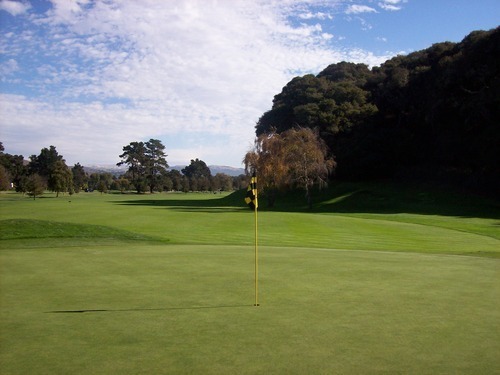 The fairways and rough were also in excellent condition as they were very green, lush and nice to hit from. The bunkers were filled with nice soft/heavy sand. The tee boxes were level and consistent. No complaints at all in terms of the conditioning right now. They did have most of the ponds covered with nets to try and drive the coots away for winter, but that’s understandable. Unfortunately, it’s not having much effect so far. The service was great and the staff really made us feel welcome. 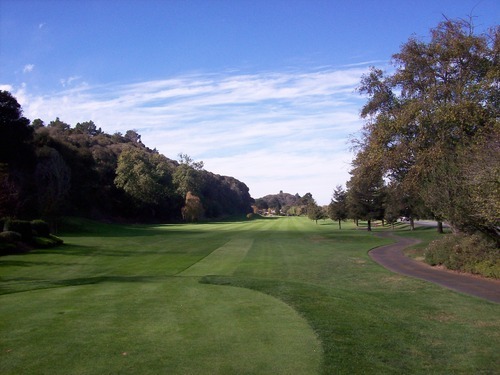 The course is semi-private, meaning they reserve certain times only for members and lodge guests, but there are plenty of public tee times available. They are working on a major renovation of the lodge right now, so that is set to reopen in April 2013. 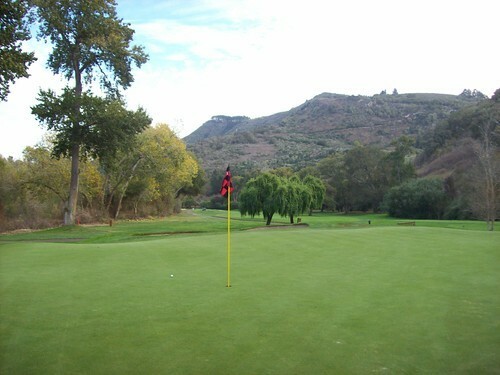 Quail Lodge is a very nice course with reasonable rates for the area it’s located and the quality of service you get. 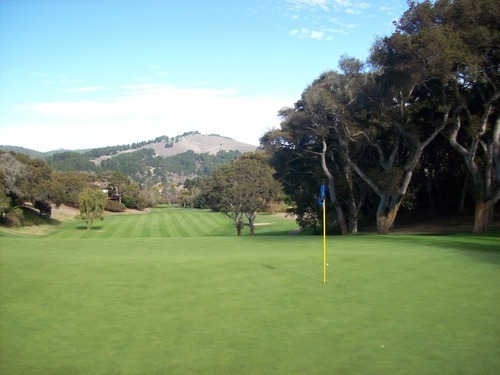 I wouldn’t put it ahead of any of the Pebble courses on your bucket list, but it’s a worthy option if planning a trip to the Monterey Peninsula. View some updated pictures of Quail Lodge from October 2016, after more renovations had been made. 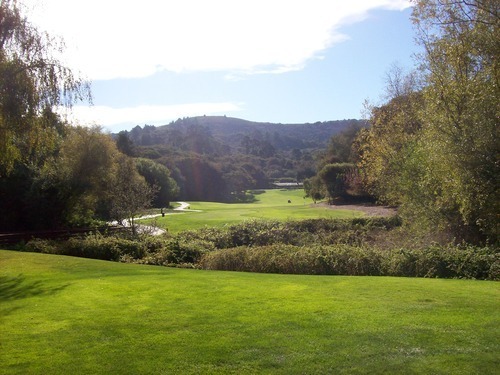 From Quail Lodge, we hit the road and made our way up into San Francisco. We hit a little traffic along the way, but nothing horrible until we reached the southern edge of the city. We were in town to see a comedy show from one of our favorite comedians, Louis CK. We decided to walk from our hotel (Marriott Fisherman’s Wharf) to the theatre (Louise M. Davies Symphony Hall). When we mapped it, it was only 2.4 miles, so we figured it would be a decent walk and we could stop and grab a bite to eat along the way. We took a very circuitous route, walking through much of Little Italy and Chinatown. In total, we probably walked closer to six miles through the hilly streets of San Francisco. We stopped briefly enough to stuff our faces with burgers and fries (okay, nothing great) from Super Duper on Market Street and got to the venue just in time for the show to start. Louis was great as always and Todd Glass (another personal favorite) opened, so it was worth the walk. Of course, we took a cab back to the hotel and that was much more enjoyable! We were supposed to play Friday on the way home. 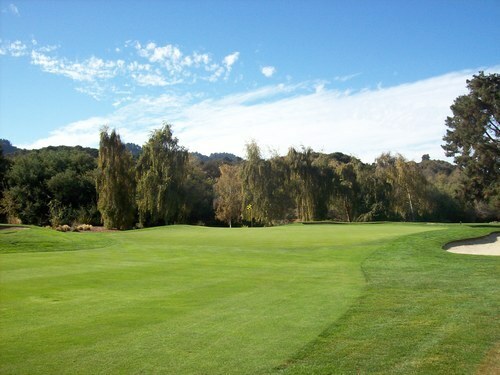 We had an early morning round set at Cinnabar Hills Golf Club in San Jose, which I was very much looking forward to. However, the weather had turned on us and it was raining all morning. By the time we got to the course, it was pouring and we reluctantly chose to cancel our round. 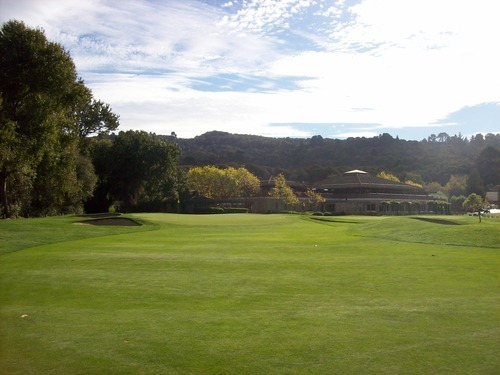 The course looked as interesting and beautiful as I expected and the clubhouse was huge and gorgeous. It featured a bit of a golf museum inside with a ton of classic memorabilia and even full-size replicas of some of golf’s most sought-after trophies (Ryder Cup, Wannamaker Trophy, etc.). We drove all the way home from there without anything terribly eventful the rest of the drive. Without golf that day, we got home much earlier than expected, but we were plenty exhausted and two full weekend days of rest will be greatly welcomed!